STATE Your Passion: It’s no secret that students, faculty, and staff at Illinois State University state their passion every day. What might not be as obvious is that Redbird donors can state their passion, too. The Joyce Morton Kief scholarship honors a passionate contributor to Illinois State. In 2006, the Joyce Morton Kief Future Professional Award was established by the School of Kinesiology and Recreation to annually support a student studying in KNR. Candidates must have achieved a minimum cumulative GPA of 3.0/4.0 and must have demonstrated persistence, work ethic, and high standards in academics and professional activities. The award recipient is selected by the KNR faculty, and the recipient is recognized to be an outstanding professional in their chosen career. When it comes to being an outstanding professional in one’s chosen career, Kief leads by example. She began her career at Illinois State University in 1966 by joining the teacher education faculty in what was then the Health, Physical Education, Recreation, and Dance (HPERD) department. In the beginning years of the rise in women’s intercollegiate sports, the department had strong ties with ISU Women’s Athletics, which made it easy for her as a faculty member to become involved with coaching. After Kief’s first year of teaching, she volunteered to work with and coach the women’s track and field team, later adding cross country and indoor opportunities as well. “I eventually moved into an even split teaching/coaching position and was the last teacher/coach remaining in that department, now called School of Kinesiology and Recreation,” said Kief. 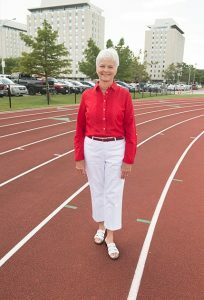 During her time as a coach, Kief’s teams won many conference championships, including three Triple Crowns, meaning that her teams won the cross country, indoor, and outdoor championships all in the same year. No other team accomplished this while Illinois State was a member of the Gateway Conference for women’s sports. She also had one national champion and numerous AIAW and NCAA competitors. Kief was selected to be a 1987 assistant coach and 1989 head coach for the women’s Olympic Festival North Team. After 24 years of coaching, Kief ended her coaching career as the head women’s manager at the 1991 Pan American Junior Athletic Championships in Kingston, Jamaica. In acknowledgment of her coaching expertise and contribution, Kief has been inducted into the Illinois State Athletics Percy Family Hall of Fame. After her retirement from coaching, Kief continued to teach full-time and assume leadership roles within the department, including program director for five years and assistant school director for five years. Other career highlights include developing the Campus Recreation Outdoor Program and organizing student exercise science and athletic coaching clubs on campus, serving as sponsor for both. She also helped start Bloomington-Normal’s first road race, “Run for Your Life,” sponsored by HPERD, and she co-directed the community’s first exercise/nutrition program broadcast on local television. As a youth, Kief always loved the excitement in a competitive sport challenge. Her motivation came from an internal desire to achieve her goals and expectations. Competition for her meant exceeding her previous accomplishments, rather than winning at all costs. It meant dedicating her efforts to attain her best results, and persevering to the conclusion of the challenge. As a coach, winning with honor was about succeeding with integrity and humility. Kief’s career is an example that KNR students can look to when it comes to setting goals. The Joyce Morton Kief Professional Award emphasizes her passion for meeting high expectations of herself and her peers. Kief is hopeful the award will perhaps help the student recipients stay connected to Illinois State and serve as a reminder of the many opportunities they had available here. What advice would she give to a new undergraduate student? “Be as well-rounded as you can be, and be bold enough to volunteer for extra projects or assignments that are presented in your classes or academic major. Be active in your student clubs, which help to provide leadership experiences. Complete your assignments on time, and always go that ‘extra mile’ when given a job to do. It is sometimes easy to complete a task as quickly as possible and just to ‘make do’—but it is so much more rewarding when you put your heart and soul into something. Interested in giving back and stating your passion? Contact Lora Wey, executive director of annual giving, at (309) 438-4483 or lwey@IllinoisState.edu.